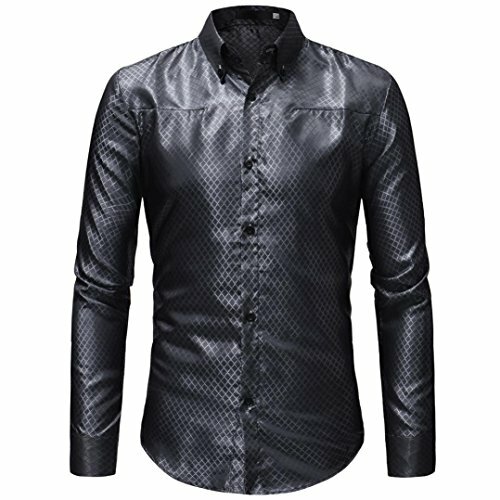 OWMEOT Mens Classic Slim Fit Contrast Inner Long Sleeve Dress Shirts (Black, L) by OWMEOT at movies-out.com. Hurry! Limited time offer. Offer valid only while supplies last. ❤️❤️NOTE: Please compare the detail sizes with yours before you buy!!! Use similar clothing to compare with the size. ❤️Size:M ~Bust:100cm/39.4" ~Shoulder:44cm/17.3" ~Sleeve:61cm/24.0" ~Length:69cm/27.2"
❤️Size:L ~Bust:106cm/41.7" ~Shoulder:45.5cm/17.9" ~Sleeve:62cm/24.4" ~Length:71cm/27.9"
❤️Size:XL ~Bust:112cm/44.1" ~Shoulder:47cm/18.5" ~Sleeve:63cm/24.8" ~Length:73cm/28.7"
❤️Size:XXL ~Bust:118cm/46.4" ~Shoulder:48cm/18.9" ~Sleeve:64cm/25.2" ~Length:75cm/29.5"
❤️Size:XXXL ~Bust:124cm/48.8" ~Shoulder:50cm/19.7" ~Sleeve:65cm/25.6"~ Length:77cm/30.3"